We had a neighborhood party in our court recently. I decided to bring cupcakes and brownies. And my daughter decided it would be helpful to surprise me and make them ahead of time–while I was upstairs getting ready. Remember the mini-disaster I told you about when my kids baked cookies a couple weeks ago? Well, this one was not-so-mini. I came downstairs to find her working happily in the kitchen, three different bowls of ingredients going on at once, and five (FIVE) boxes of cake and brownie mix open. It was one of those moments where you walk in the room and it takes you a minute to realize what’s happening. And once I did realize, I had to take be careful about my reaction. “What are you doing?” I asked, trying to sound…ahem…pleased. “I’m helping you!” she said proudly. Even though it took a while to clean the kitchen, and we had to throw one batch of brownies out (the one in the clear bowl in the first picture) because it had a tad too much water in it, the rest of the desserts turned out great. And it’s the thought that counts, anyway. Awww, the intentions were right…LOL! That was SO sweet of her! And kudos to you for not losing it. :) I know I would have. What a sweetheart, and good for you mom for not losing it when you saw the mess! 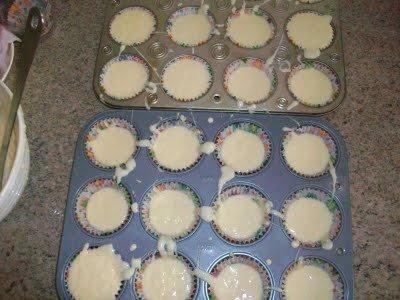 That's so thoughtful of her..making cupcakes for you. I so have a hard time when my daughter is cooking, oh the mess, I haven't got it in her brain yet she must clean it. glad the cakes came out. Your reaction was so calm and careful. I must say I'm impressed! You must still be overflowing with brownie goodness! You are such a great mom! I probably would have been spastic! I'm sitting here planning next week's meals with my 12-year-old son who is now homeschooling. Cooking is one of his favorite things to do. I can't wait until we get in the kitchen. We're studying the countries in the South Pacific…New Guinea, Australia, New Zealand. At least you arrived at the party prepared–well prepared! What a sweetheart! Just keep encouraging that helpfulness, one day it will be wonderful! SO cute…and since our son is only 2.5, all that "help" is right around the corner for me. Right now, his help is always caught ahead of time. LOL. Well, she was trying to help! I think you are a much more patient mom than I am! I was raised by a long line of yellers…I'm trying, praying, working on stopping! It sure was a sweet gesture though! Awww. My 9 year old girl is almost to the point where she wants to jump in and bake things herself. I don't look forward to the mess, but I do look forward to the independence.Blessings! The motivation for their actions is far more important isn't it? Oh my! It sounds like you handled that rather well! How sweet of her to want to help. I suppose cleaning up the mess is worth it! What a sweet daughter! P.S. 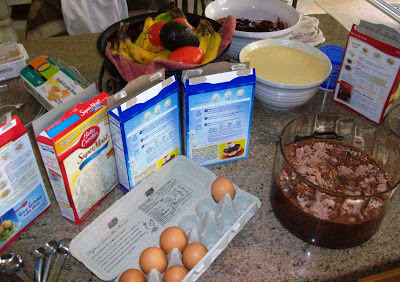 "thou must not stock up on so many boxes of cake mixes at once…" :)Another p.s. : it almost looks like you have an identical kitchen countertop to mine. Quartz? "And once I did realize, I had to take be careful about my reaction. 'What are you doing?' I asked, trying to sound…ahem…pleased. "I am trying to be more patient and less reactive to my children, too. Love her willingness to help :) ! !